Stops and opens in just 10 seconds. 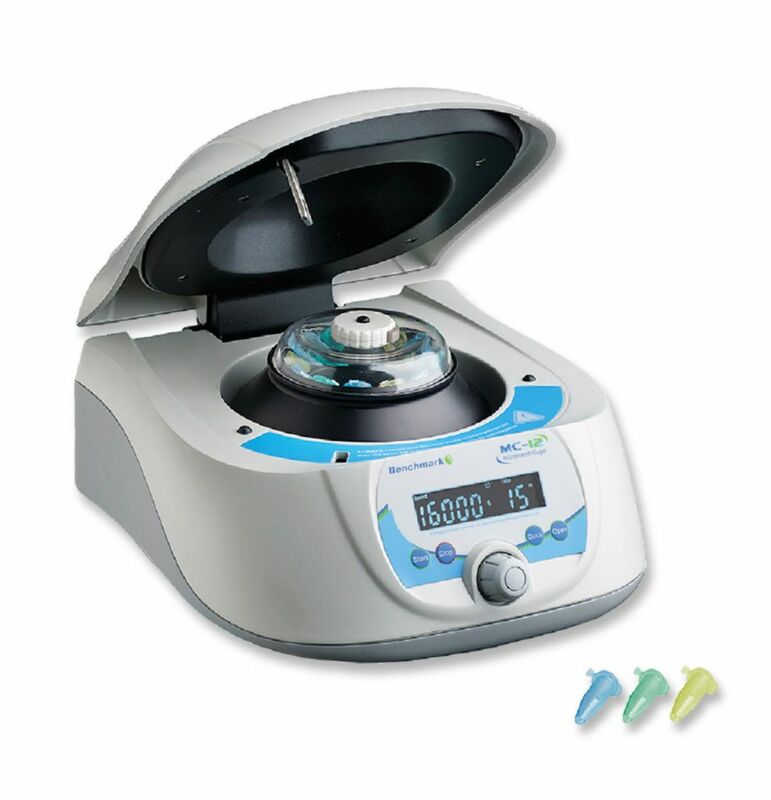 Benchmark's MC-12 is the first and only compact microcentrifuge capable of achieving centrifugal speeds up to the critical threshold of 16,000 xg, often held as the standard for many molecular biology/DNA protocols. It's brushless, maintenance free drive system make it powerful, yet compact enough to allow each work station to be fully equipped with a personal centrifuge. The MC-12 defines a new class of microcentrifuge: compact, quick, powerful, and affordable. All aspects of microcentrifuge performance were taken into consideration and no compromises were made. In addition to its unsurpassed speed, the MC-12 also delivers shortened acceleration/deceleration times, whisper quiet operation and its computer-designed airflow pattern minimizes sample temperature increases during longer runs at high speeds. All operating parameters are set using a single, conveniently located control knob and the large, bright LCD provides a clear indication of time and rpm or g-force. A separate momentary spin button permits instant spin downs, without setting or distrubing any present parameters. The aircraft grade alumunium rotor accepts 1.5 to 2.0mL tubes directly, as well as 0.5 to 0.2 mL tubes with optional adapters. For applications requiring sub-ambient temperatures, the MC-12 is cold room safe.